Katy Daley-Mclean MBE announced as our new patron! 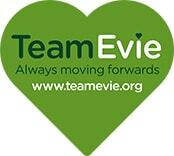 Team Evie announced as NEPO Charity of the Year! Thank you to Out of Eden! We are proud to announce our link with Jomanda Sheep! Welcome to the Team – Matt Strickland and Nici Hewitson! Events announced with James Graham! The Butterfly Awards 2017 – Award Winners!